If you've ever seen Little Devil Horns Barrettes, you've seen Dez Demona's hottest product. 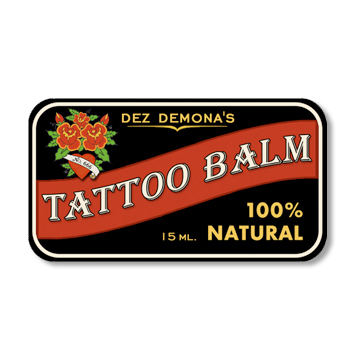 As she expanded her product line, we were asked to design a fun label for a healing, after-tattoo salve. These stickers were applied to adorable slide-top tins, each holding a special concoction of herbs and oils. Magic stuff!